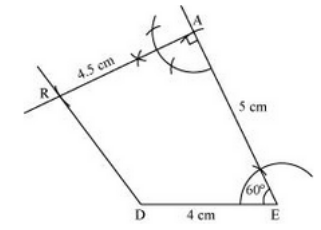 Q.1 Construct the following quadrilaterals. Sol. 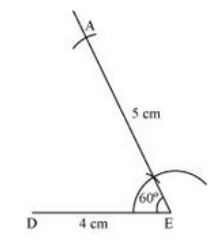 Step 1: Draw a line segment DE of length 4 cm and an angle of 60° at point E. Now, keep E as centre and cut an arc EA of 5 cm from this ray. 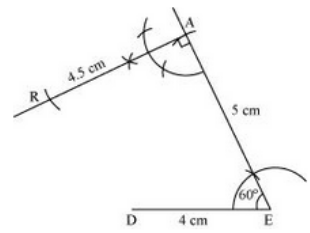 Step 2: Draw an angle of 90° at point A. 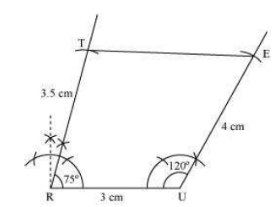 Now, keep A as centre and draw an arc of radius 4.5 from this ray. Step 3: To complete quadrilateral DEAR, join D to R.
Sol. Step 1: Draw line segment RU of 3 cm. 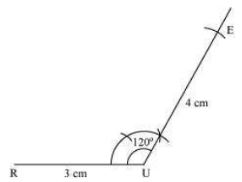 Now, make angle ∠U = 120ᵒ. Keep U as centre cut a line segment UE of 4 cm. Step 2: Draw ∠R = 75ᵒ. 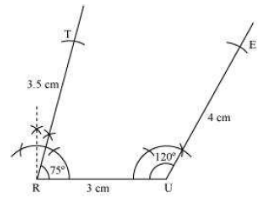 And keeping R as centre cut a line segment RT of 3.5 cm. Step 3: To complete quadrilateral TRUE, join T to E.